The past few days have been rainy as all get out around here. On Thursday morning we were up SUPER early (which if you know Sweet P at all, any time before 7:45 classifies as super early) so we had time to kill before heading to Trader Joe's and Costco for groceries. The Farmer left at 7:15am and 2 seconds it later the sky opened up and dropped marble sized hail on the ground. It was crazy! 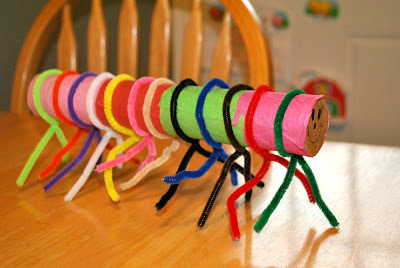 Anyway, with that time we made a colorful caterpillar. 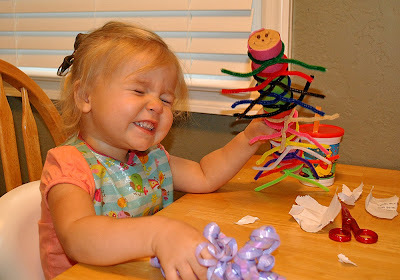 We used recycled goods and some fun pipe cleaners she got for her birthday. As usual, I did most of the work. She picked out the colors of the legs and was cutting paper with these scissors (also a birthday gift). Colorful Caterpillar is well loved, he even came grocery shopping with us! Sweet P tore strips of tissue paper and I glued them with the glue stick to the paper towel roll. 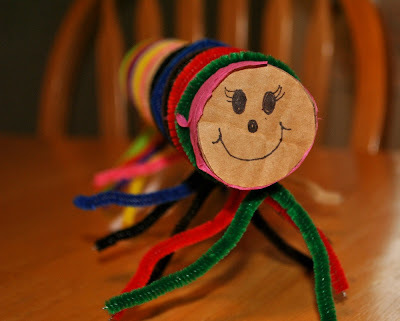 Then, we twisted pipe cleaners around the body to form legs. 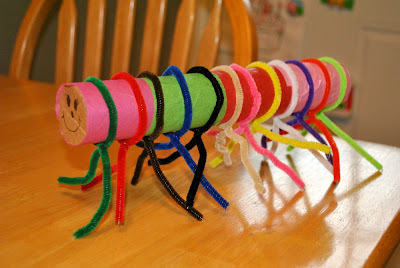 Our caterpillar has 12 legs, you do not have to use that many! Cut a small circle the size of the end of the paper towel roll out of the small piece of cardboard. Draw a face with your Sharpie. Fit the circle into the end of the roll. Amazingly my cut out fit perfectly so I didn't need to tape/glue it on. My favorite part is that he can stand up on his own! Viola! Colorful Caterpillar! 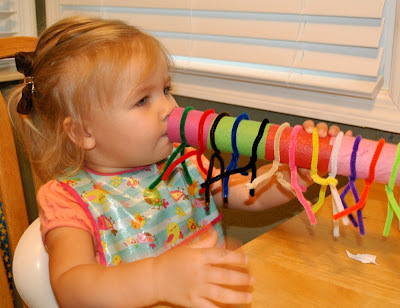 This project would go great with The Very Hungry Caterpillar.